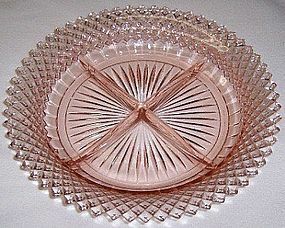 This is a really pretty pink Coronation Banded Fine Rib depression glass Footed Sherbet made by Hocking Glass from 1936 to 1940. This Sherbet measures 2 Inches high X 3 3/4 Inches in diameter. It is in excellent condition with no chips or cracks. Be sure to search our other Coronation available. We guarantee all items to be as described. Feel free to email with any questions. THANK YOU. 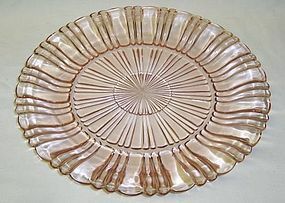 This really pretty pink Old Cafe depression glass 9 3/4 inch Dinner Plate was made by Hocking Glass from 1936 to 1938 and 1940. This Dinner Plate is in very good condition with no chips, cracks or scratches. Be sure to search our other Old Cafe available. We guarantee all items to be as described. Feel free to email any questions. THANK YOU. 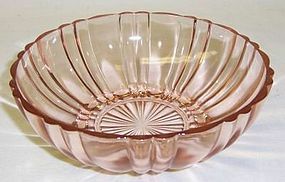 This really pretty pink Mayfair Open Rose Depression Glass 11 3/4 inch Low Flat Console Bowl was made by Hocking Glass from 1931 to 1937. This Bowl is in very good condition with no chips or cracks. Be sure to search our other Hocking glass available. We guarantee items to be as described. THANK YOU. 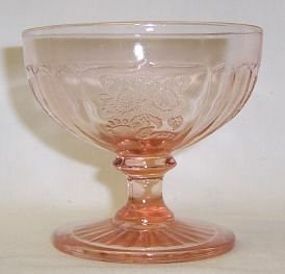 This pretty pink Mayfair Open Rose 3 1/4 inch high Footed Sherbet was made by Hocking Glass from 1931 to 1937. This Sherbet measures 3 1/2 inches in diameter at the top and is in very good condition with no chips, cracks or scratches. Be sure to search our other Mayfair available. We guarantee all items to be as described. Feel free to email with any questions. THANK YOU. 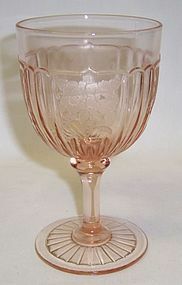 This really pretty pink Mayfair Open Rose Depression glass 5 3/4 inch high Water Goblet was made by Hocking from 1931 to 1937. This Goblet measures 3 1/4 inches in diameter at the top and is in very good condition with no chips, cracks or scratches. There is a bubble in the glass on the foot, common to depression glass, done in the making of it. Be sure to search our other Mayfair available. We guarantee all items to be as described. THANK YOU. 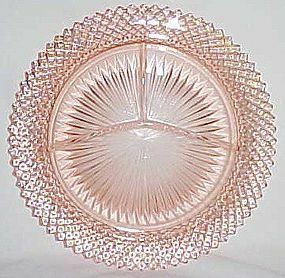 This pretty pink Miss America depression glass 10 Inch Grill Plate was made by Hocking Glass from 1933 to 1937. This Plate is in very good condition with no chips or cracks. Be sure to search for other Pink Miss America available. We guarantee all items to be as described. Feel free to email with any questions. Thank You. 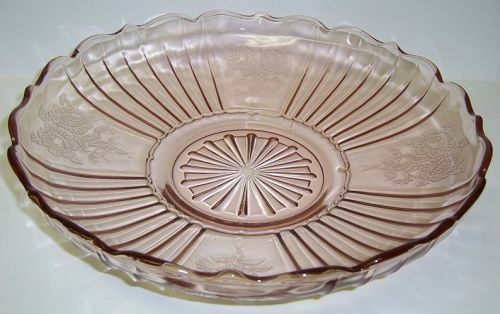 This pretty pink Miss America depression glass 8 3/4 inch 4-Part Relish is in very good condition with no chips or cracks. 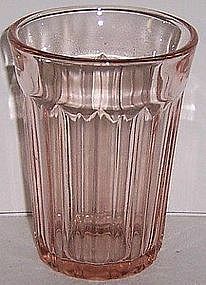 It was made by Hocking Glass from 1933 to 1937. Be sure to search for other Miss America available. We guarantee all items to be as described. Feel free to email with any questions. Thank You. 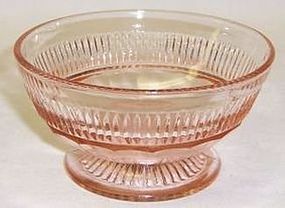 This really pretty pink Old Cafe depression glass 3 3/4 inch Footed Sherbet was made by Hocking Glass from 1936 to 1938 and 1940. This Sherbet is in very good condition with no chips, cracks or scratches. Be sure to search our other Old Cafe available. We guarantee all items to be as described. Feel free to email any questions. THANK YOU. 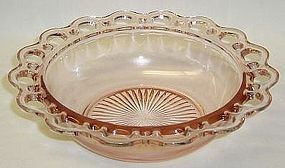 This really pretty pink Old Cafe depression glass 5 1/2 inch Cereal Bowl was made by Hocking Glass from 1936 to 1938 and 1940. This Cereal Bowl is in very good condition with no chips, cracks or scratches. Be sure to search our other Old Cafe available. We guarantee all items to be as described. Feel free to email any questions. THANK YOU. 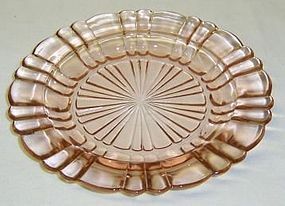 This pretty pink Old Cafe depression glass 6 1/2 inch Dessert or Sherbet Plate was made by Hocking Glass from 1936 to 1938 and 1940. This Plate is in very good condition with no chips, cracks or scratches. Be sure to search our other Old Cafe available. We guarantee all items to be as described. Feel free to email any questions. THANK YOU. 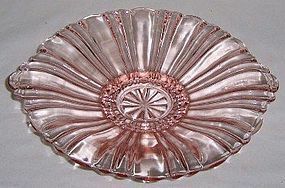 This really pretty pink Old Cafe depression glass 8 Inch Low Candy Dish was made by Hocking Glass from 1936 to 1940. 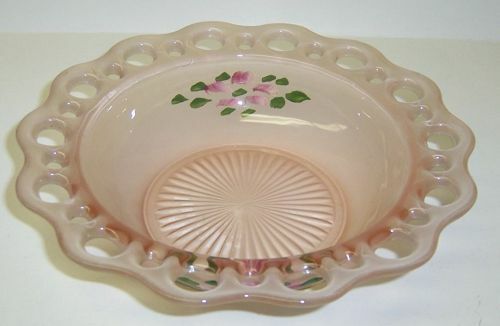 This Candy Dish is in very good condition with no chips, cracks or scratches. Be sure to search our other Old Cafe available. We guarantee all items to be as described. Feel free to email with any questions. THANK YOU. 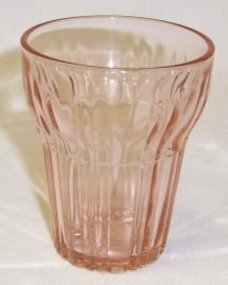 This really pretty pink Old Cafe depression glass 3 1/4 inch Juice Tumbler was made by Hocking Glass from 1936 to 1938 and 1940. This Tumbler is in very good condition with no chips, cracks or scratches. Be sure to search our other Old Cafe available. We guarantee all items to be as described. Feel free to email any questions. THANK YOU. 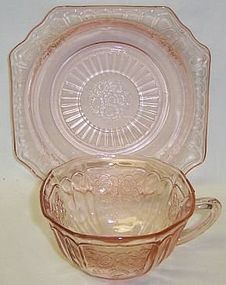 This really pretty pink Old Cafe depression glass Cup and Saucer was made by Hocking Glass from 1936 to 1938 and 1940. Both the Cup and Saucer are in very good condition with no chips, cracks or scratches. Be sure to search our other Old Cafe available. We guarantee all items to be as described. Feel free to email any questions. THANK YOU. 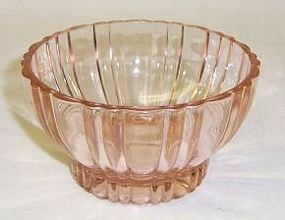 This pretty pink Old Colony Lace Edge depression glass Plain Bowl was made by Hocking Glass from 1935 to 1938. This Bowl measures 9 1/2 inches in diameter X 2 1/2 inches high and is in very good condition with no chips or cracks. Be sure to search our other Old Colony available. We guarantee all items to be as described. Feel free to email with any questions. THANK YOU.